Classical antiquity (also the classical era or classical period) is a broad term for a long period of cultural history around the Mediterranean. 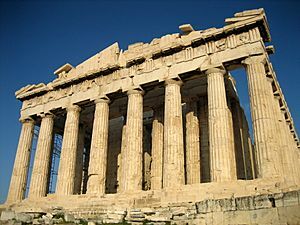 It includes the civilizations of Ancient Greece and Ancient Rome, known as the Greco-Roman world. Classical antiquity is the period in which Greek and Roman literature (such as Aeschylus, Ovid, Homer and others) flourished. The earliest period of classical antiquity took place before the re-appearance of historical sources after the Bronze Age collapse. The earliest Greek alphabetic inscriptions are in the first half of the 8th century. Homer is usually assumed to have lived in the 8th or 7th century, and his lifetime is often taken as marking the beginning of classical antiquity. The traditional date for the first Ancient Olympic Games, in 776 BC, was also around this time. In Roman legend, the city of Rome was founded in 753 BC. The earliest settlement at the Roman Forum seems to have taken place around this time. The Phoenicians originally expanded from Levantine ports, by the 8th century dominating trade in the Mediterranean. 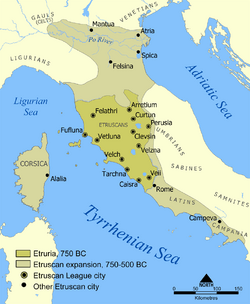 Carthage was founded in 814 BC, and the Carthaginians by 700 BC had firmly established strongholds in Sicily, Italy and Sardinia, which brought about conflicts of interest with Etruria. The Archaic period followed the Greek Dark Ages, and saw the rise of democracy, philosophy, theatre, poetry, as well as the revitalisation of the written language (which had been lost during the Dark Ages). Pottery styles of the later part of the Archaic age are the black-figure pottery, started in Corinth during the 7th century BC. Its successor was the red-figure style, developed by the Andokides in about 530 BC. 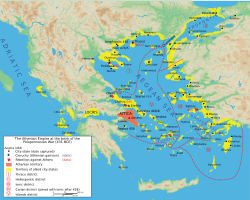 Delian League ("Athenian Empire"), right before the Peloponnesian War in 431 BC. 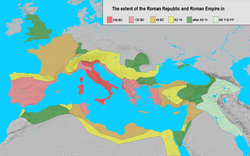 The extent of the Roman Republic and Roman Empire in 218 BC (dark red), 133 BC (light red), 44 BC (orange), AD 14 (yellow), after AD 14 (green), and maximum extension under Trajan 117 (light green). The classical period of Ancient Greece was from the fall of the Athenian tyranny in 510 BC to the death of Alexander the Great in 323 BC). During this period cane the long struggle between Sparta and Athens, and the wars between the Greeks and the Persians. The rise of Macedon in the 4th century overturned all other political systems, at least for a while. The Hellenistic period began with Alexander, when Greek became the lingua franca far beyond Greece itself, and Hellenistic culture came in contact with the cultures of Persia, Central Asia, India and Egypt. The Hellenistic period ended with the rise of the Roman Republic to a super-regional power in the 2nd century BC and the Roman conquest of Greece in 146 BC. The Roman Forum was the central area around which ancient Rome developed. The republican period of Ancient Rome began with the overthrow of the Monarchy at about 509 BC and lasted over 450 years until its subversion, through a series of civil wars and the Imperial period. Determining the precise end of the Republic is a matter of dispute. Roman citizens of the time did not recognize that the Republic had ceased to exist. It could be said that Rome was already of imperial character since it conquered Gaul, Illyria, Greece and Hispania, and the Roman provice Asia. During Late Antiquity Christianity rose under Constantine I, and finally became the Roman imperial cult in 393. 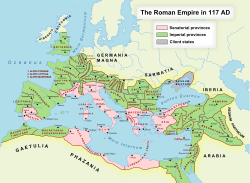 Successive invasions of Germanic tribes meant the thr end of the Western Empire in the 5th century, but the Eastern Empire persisted throughout the Middle Ages as the Byzantine Empire. Respect for the ancients of Greece and Rome affected politics, philosophy, sculpture, literature, theater, education, architecture and even sexuality. In politics, the presence of a Roman Emperor was felt to be desirable long after the empire fell. This tendency reached its peak when Charlemagne was crowned "Roman Emperor" in the year 800, an act which led to the formation of the Holy Roman Empire. The notion that an emperor is a monarch who outranks a mere king dates from this period. In this political ideal, there would always be a Roman Empire, a state whose jurisdiction extended to the entire civilized western world. Classical antiquity Facts for Kids. Kiddle Encyclopedia.